Don't you just love, love, love it when you go out to the garden and there is actually something to be picked? Look what we are having for supper! Woo hoo!!!!! Have a good night - hugs to all! Food for thought: Never trust your dog to guard your burger!!! Goodness, it's been a week since I've posted! So sorry. so I can now leave comments from there! Hope that you are all doing well! and the theme is red, white, and blue. With the 4th of July right around the corner, I just had to find time to create a patriotic card. This cute set is "Firecracker Bugs", and comes complete with DP and sentiments. I added some yellow, gold, and white stickles for lots of sparkle. Head on over to Paper Playtime, and join in their challenge - you could win a Doodle Pantry prize - how much fun would that be???!!! Have a great evening - I'm off to cook supper. Food for thought: I'm going to start a new club, "The Trio Club".....I need three pairs of glasses - one for driving, one for reading, and one to find the other two! The Other Patti Sue, and Kim. Please drop me an e-mail with your mailing addresses, and I will get your items in the mail! I just love giving things away, don't you? Good morning! I'm not sure where this week has gone. My best friend (ice bag :) and I have spent most of it curled up in the recliner! Getting better though... hopefully I'll be stalking ya'll full time next week! 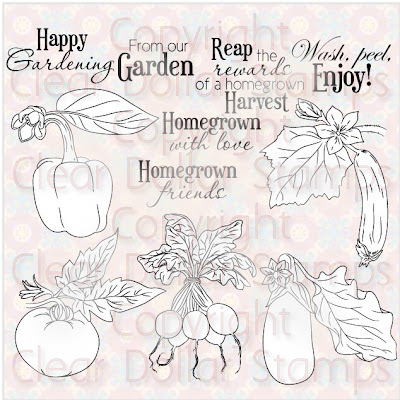 My cute and quick card, features some of the Clear Dollar Stamps new digi releases. The DP's are from the "Patriotic Charlie" set, and the beautiful image comes from the "Garden of Life" set. Both are pre-colored - just print, cut, adhere, DONE! Gotta love it, and who wouldn't enjoy receiving this cute card in the mail? Hope that you are all having a good week. Mine's gone well so far! Am working on Elmo - have a little flat box full of supplies in my lap - too funny! Most folks don't care how much you know. They want to know how much you care! Well, good morning! Hope that you all survived your weekend. I have to begin by apologizing for not commenting on your blogs this weekend. Believe me, I was there! I saw, I squealed, and I loved your creations! However, since Friday, I've been in a recliner with a propped up foot, ice bag, etc. Not sure what I did, but I couldn't bear any weight, walking was difficult, and the swelling was terrible. Even had to resort to crutches on Friday night! Long story short, I could use only the laptop, and that old thing will NOT let me leave comments! So, I'm going to try to be back on the desktop for at least a bit today!!! Mmmmmm.....Chocolate! At least one has to assume that chocolate is what this darling Baking Bear Digi from Clear Dollar Stamps is whipping up for us this morning! Is this not the sweetest image? This cutie patootie is one of the new releases for June at CDS. If you haven't been over there yet, hop over and check out their store - the new and older releases are all so much fun! This set actually has the images, sentiments, and designer papers all in one very low price! 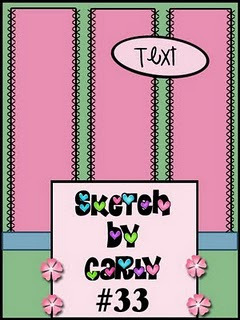 I'm going to enter this in the sketch challenge at Sketches by Carly. You still have three days to enter, so grab this fun sketch and get creative!!! 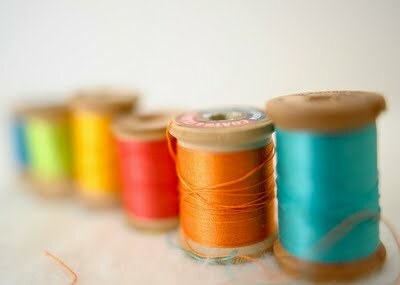 No rules - just leave a comment here on this post and tell me something fun about yourself! Example: Before I check out of this world, I want to zip line and sky dive! OH! AND...I'm going to a U2 concert on July 17th!!!!! OMG!!! DS bought tickets for me and DD to go and I'm so excited! As always, you certainly don't have to become a follower - if you're following, I want it to be because you want to be here! But if you ARE a follower, you will get two entries! 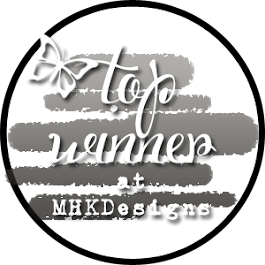 Winner will be chosen via random DH drawing on Wednesday night, and will be posted on Thursday a.m.
Food for thought: No matter how stressful, any day that you spend above ground is a good one!!! Hello! Hope you are all having a wonderful day - TGIF!!! Thanks Cath for another fun image! I just used some CS scraps, a Martha Stewart bubble punch, and a TAC sentiment. Hope the fabulous rainbow of colors brought you a smile! I am also entering this in the CAS-ual Friday's challenge, which is Colorblocking. Food for thought: Worry doesn't help tomorrow's troubles, but it certainly can ruin today's happiness!!! I have a really quick cute card for you today. I am not kidding at all about the quick...seriously. Once I had the printing of the image and DP's done, the card took 5 minutes and 13 seconds. That included using the spellbinders! for a cute, speedy greeting to someone special! This little critter is "Beary Cute", and you can find it at the Doodle Pantry Store. Baker's twine is Jillibean soup. CS is Bazzill Basics. Check back over the weekend for some itty bitty blog candy! Food for thought: Why did the farmer use a steamroller on his farm? He was trying to raise mashed potatoes! Good morning! Goodness, can you believe we are halfway through another month? Yikes! Time really does fly when you're having fun! Speaking of fun - I promised a surprise today! A few weeks ago, I was invited to become a member of the Digi Design Team at Clear Dollar Stamps, and of course, I said yes! How exciting to be a part of this team. The ladies are all so sweet and helpful, and the digi images and rubber stamps at Clear Dollar Stamps are wonderful! 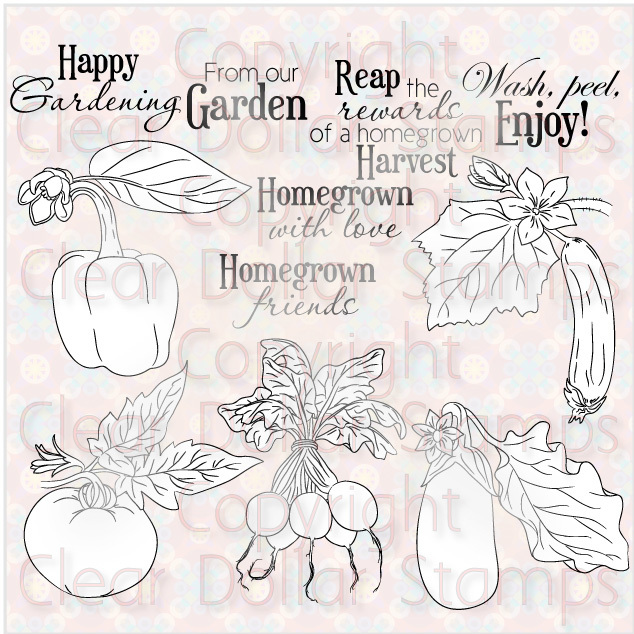 Today is a "New Digi Release Day" at Clear Dollar Stamps! I'm sharing two awesome new sets with you today. The first set was so much fun...I've never ever colored radishes before! This set, Vegetable Garden Outlines, comes with all that you see here. There are so many possibilities for this set with gardens in bloom very soon! 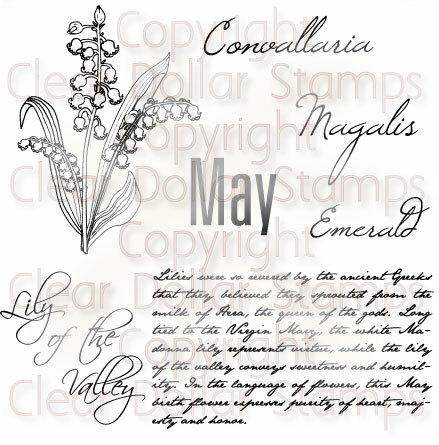 The second set I chose is a Flower of the Month set, Lily of the Valley. I used the Happy Anniversary sentiment, as it seems there is always an anniversary to remember. This set comes with everything you see below. You can find these, and several more newly released sets in the Clear Dollar Stamps Store. 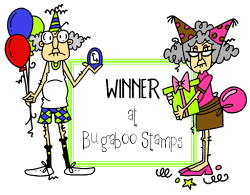 Also, don't forget to stop by the Clear Dollar Stamps Blog to see them all in one place! Food for thought: I'm too blessed to be stressed. Happy Tuesday, dear cyber-friends! Hope today is off to a great start for you all. I promised you something pretty today, and here she is! I think these little C.C. 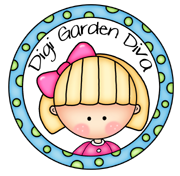 Designs Birgitta's are the prettiest little gals! This is one of the new June releases at All That Scraps. She's called "Ice Cream Birgitta". Sigh...I wish the dusting of glitter on her ice cream cone had shown up in the photo! What's in it? CC Designs Ice Cream Birgitta, Amy R. Stamps Wish You Were Here, Copic Markers, Spellbinders Labels 18, Twill and Grosgrain Ribbons Hobby Lobby, Zig Pen for 'stitching', Bazzill Cardstock, Martha Stewart yellow, lime, and aqua DP. 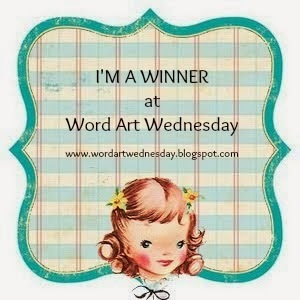 This card is for the Wednesday challenge at All That Scraps. It was a color challenge: aqua, yellow, and lime. Try as I might, the photograph looks blue, but I totally PROMISE you that it's aqua! Hope she makes you run out for an ice cream cone right after you go shopping at All That Scraps! You really should check out this month's releases - they are just darling! The Congratulations sentiment is a Just Rite demi phrase, and the "sweet" sentiment is also a new release at ATS - "Wish you were here" by Amy R. Stamps. Pretty sweet, don't you think??? Well, I'll be back tomorrow morning with a surprise, and I'm thinking that the weekend will be a good time to offer up some "itty bitty blog candy" so be sure to check back!!! Food for thought: I've never been hurt by anything I didn't say! Well, the wedding is over, and it was a success. Everything went off as it was planned, and the bride and groom and their families loved the favors. As I said last week, it was nice for me that Misty chose the two easiest favors in the entire box of samples. She chose the green striped paper, and wanted the little roses, so she was quite pleased! These were covered Hershey's miniature candies. I covered them first with the striped papers, then with the photo strip. I made a piece for the back to help stabilize the candies, and also to put Misty and Carl's thank you note. These are the little pockets that we paper crafters love to make. Started with a square, and made a few folds. Adhered the Ghirardelli candy with a piece of 1" scor-tape. Punched a hole through the front, put the flower stem in. Secured it on the inside with small piece of packing tape, and tied the ribbon around the flower. Added the photo with scor-tape. This is what I did with a whole lotta leftover candies. I just did this on an address label with Printmaster, and wrapped. Well, that's it, folks! Spent a few minutes this morning with the vampire ladies at the clinic having some six month checkup labs done, spent HOURS trying to find something in my closet that fits, then shopping this whole (teensy) town for something that fits...ugh. Have a reception for my DH to go to tonight, and I don't much like wearing 'real clothes' anymore! Have a great night, and I'll be back tomorrow with something pretty, and the next day with a surprise! Food for thought: Why do we spend so much time buying things we don't need, with money we don't have, to impress people we don't like? Yep, gotta do laundry today! Can't put it off any longer. In fact, the dryer is due to buzz any minute (ugh...just buzzed) with the first load of the day! Hope that this FRIDAY (woo hoo!) finds all of you well, and that you have a very nice weekend to look forward to. Last night, I decided that I simply HAD to play for a few minutes. So, I took this fabulously fun PRE-COLORED image from Doodle Pantry, and sat at my very messy (full of green scraps) desk, and worked up a CAS card. The cute sheep, border, and sentiment are from this month's new release, and the Patchwork Star on the right is a new set this month as well. You can find them at the store, here. I printed out the card front, complete with all artwork, and adhered it to a blue card base. Between the border and the main focal images, I added three strips of scor-tape. I peeled off one strip at a time, adding red, white, and blue glitters. I tied a floss knot and glued on the front of the patchwork star. Voila - done!!! I played, I slept like a baby, and I'm off to the laundry room...life is good! Don't forget - you still have time to participate in the Doodle Pantry Challenge #13!!! Check it out here! Hugs and smiles to all - have a great day! Food for thought: Encouragement costs nothing, but yields much! Goodness! It's been a while since I've posted. I've been pretty caught up in finishing some wedding favors. You all know how that is! This bride rocks! Of the 20+ samples that I took to her, plus a little notebook full of ideas, she liked and chose the easiest two of all. The DP she chose was a double sided satin stripe by Reminisce. As you all know, I live in a very rural area - no Michael's, Hobby Lobby's, etc., within 65 miles, to find this paper. I got on-line, and went directly to Reminisce. OMG, talk about nice people! I dealt Meagan, who rocked my world! Not only did she let me order an odd number of sheets, but she sent them FedEx so that they'd be here in time! AND...there were a few extra sheets in the box! Shown above, is what is leaving the house today, so that I can begin working on my next project - an Elmo Birthday Party for a soon to be 2 year old! Anyone with any wonderful Elmo projects, please let me know, as I'm open to suggestions!!! I will post photos of the favors up close after Saturday's wedding. PLEASE ignore my messy desk!!! Hope you all have a wonderful day! 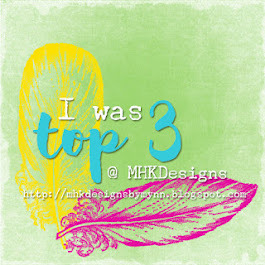 Thanks for stopping by, and I hope I'll have some time today to do some blog hopping - I've missed you! Welcome to our first ever Doodle Pantry Blog Parade! which will be available in the DP store on June 5th! We have very few rules for this parade! You should have begun the hop at the Doodle Pantry Blog, where all details are posted. 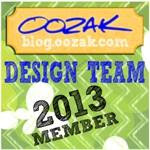 then go back to the Doodle Pantry Blog to enter your name in the linky! 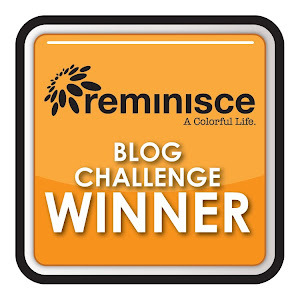 If you came here from Rebecca's blog, you are in the right place! My card for today features the new set called "Little Castle". When you open the card, everything pops up! Flying above the castle is the little bird, and marching toward the castle doors are the ant band from the "Critter Parade" set. Side view showing the pop-up card. What's in it? All coloring is done with Copics, Green Flower Soft on all greenery and trees, Stampin' Up ribbon, blue Stickles for a touch of bling! From here, you proceed to stop #3, Pat's blog. Hope you enjoy today's parade!